A 300-year-old union. A comprehensive debate. A historic decision. 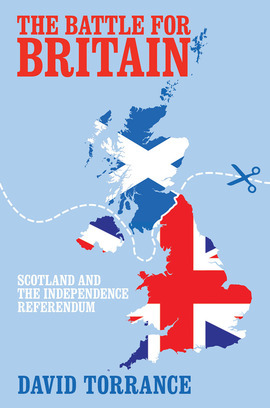 On 18 September 2014, Scots will decide their future: should the country quit the United Kingdom and take control of its own destiny, or should it remain part of what advocates call the most successful political and economic union of modern times? Everyone in the country has a stake in this decision. Now, in this fascinating and insightful new book, David Torrance charts the countdown to the big day, weaving his way through a minefield of claim and counterclaim, and knocking down fictions and fallacies from both Nationalists and Unionists. He plunges into the key questions that have shaped an often-fraught argument, from the future of the pound to the shape of an independent Scottish army. With access to the strategists and opinion-makers on both sides of the political divide, this book goes straight to the heart of the great debate, providing an incisive, authoritative, occasionally trenchant guide to the most dramatic constitutional question of our times – the battle for Britain. Brimming with historical antecedents and insightful analysis [...] likely to be required reading long after the ballots have been counted in September. [David Torrance] manages to do something that has become almost impossible - he maintains an impartial tone. Important and authoritative, this book will help future generations explain this generations decisions. Wise, balanced, witty and above all, well informed. A political must-read. Very few other contemporary writers have David Torrance’s insight and breadth of knowledge, from Chris Hoy to Eric Hobsbawm. It is truly a tour de force. If you are looking for a clear, informed and balanced guide to this subject, this book will be very hard to beat. [An]... excellent new book about the independence campaign. The Battle for Britain goes straight to the heart of the great debate, providing an incisive, authoritative and occasionally trenchant guide to the most dramatic constitutional question of our times. Torrance is an elegant writer and a fine reporter on the tidal shifts of politics, but his narrative finds room for the ideas that have brought us to where we are, the place and the moment predicted by no one just a few years ago... Part of Torrance's narrative of the journey towards the referendum is built around this fact. Artfully he gives it context. What is independence in a globalised world? What sort of autonomy counts when a small country regards a British Union entwined with a European Union? [A] timely and often insightful book. A piece of in-depth reporting as lucid and objective across a murky and contested terrain as you could wish for... [Torrance] is respectful of the facts and the positions taken by the Nationalists – yet the clarity of his analysis tends to underscore the dilemmas they face. Torrance’s work is an invaluable guide to the battle for Scotland. He is admirably even-handed in his analysis of a deeply polarised and tribal debate... The book is packed with brilliant anecdotes... It is clear [Torrance] has levels of access to opinion formers and the people who were in the room when the big decisions were taken that other journalists would kill for... The Battle for Britain is a must-read for every Westminster dweller. This lively, perspicacious account of the historic vote deserves a wide audience. Brimming with historical antecedents and insightful analysis, and written with an easy style and no little wit, The Battle for Britain is likely to be required reading long after the ballots have been counted in September.